Some razor clams in Alaska have attained the age of 18 years, and it's possible that older individuals exist. There are four different species of razor clams on the west coast of North America. Commercial harvest of razor clams has occurred in Alaska since 1916. Razor clams have been imported from North America to Europe and are now established. Females have an estimated 300 thousand and 118.5 million eggs. Commercial harvest of razor clams has occurred in Alaska since 1916 in the Cordova area and 1919 in the Cook Inlet area. Annual production levels have fluctuated greatly in both areas, reaching approximately 600,000 pounds in Cordova and 500,000 pounds in Cook Inlet. The 1964 earthquake adversely affected razor clam populations in the Cordova area. Swikshak Beach on the Alaska Peninsula is the only other beach certified for the human consumption market where commercial harvest has occurred since 1929. 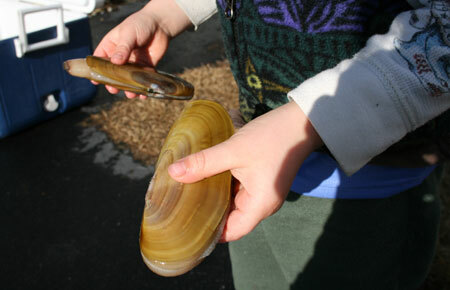 Razor clams are fished commercially as bait and food. 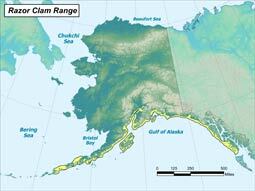 The primary area for the personal use recreational razor clam fishery in Alaska occurs between Kasilof and Anchor River (a 50 mile area) on the east side of Cook Inlet. In this area between 30,000 and 35,000 days of effort are expended annually to harvest a million clams. Whether razor clams are dug for commercial or recreational purposes, the result is the same: good eating! Razor clams are highly sought after due to their large size and delectable taste. They can be boiled, sautéed, deep fried, or tossed into soup.